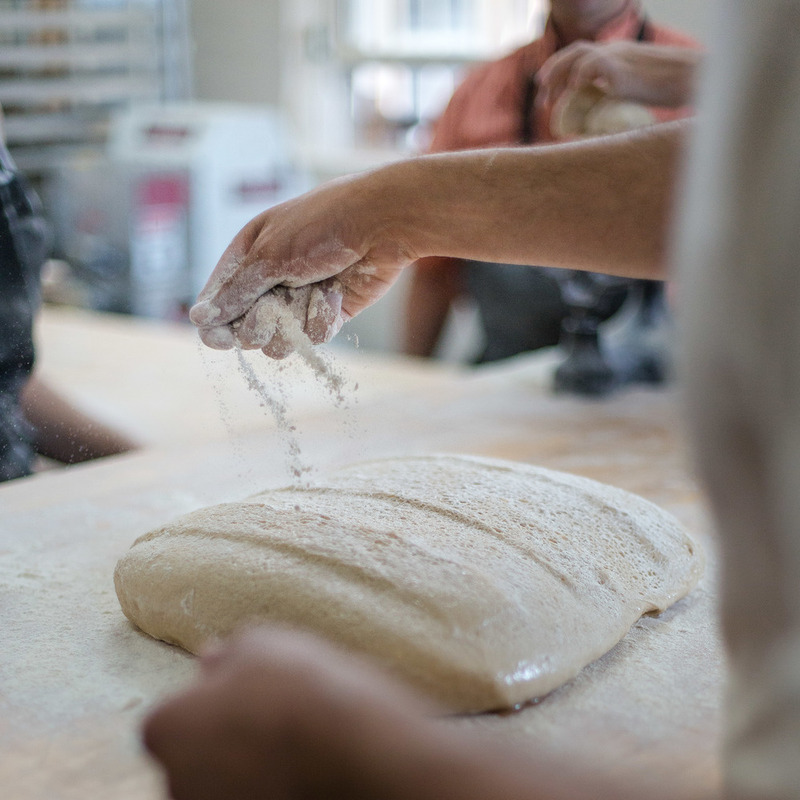 We started these classes in partnership with OGRIN, the Organic Growers Research and Information Sharing Network, and GrowNYC to help connect bakers in NYC with local flours. We had a great time, and we immediately had requests for more classes. Come take one. Class descriptions at the bottom of this page - scroll down to see a detailed explanation of what each class will cover! In this class we will go over all the basics of making great bread. The class runs all day, and we will make a LOT of bread! Topics include the chemistry and biology of bread, an introduction to fermentation skills, bakers’ math, and a range of handwork skills. Each student will get plenty of oven-time, and we will have the opportunity to talk about whatever excites us about baking. Watch out! This class has inspired students to start FOUR working bakeries! In this class we cover the basics of artisan baking, but with a special focus on baking in the home kitchen. Home kitchens present challenges—few of us have large commercial ovens to work with, and our tools are generally much smaller and less powerful than those we’d find in a professional bakery. Home kitchens also offer opportunity and flexibility—delivery deadlines are less pressing, ingredient costs less intimidating, and home tools do a great job. 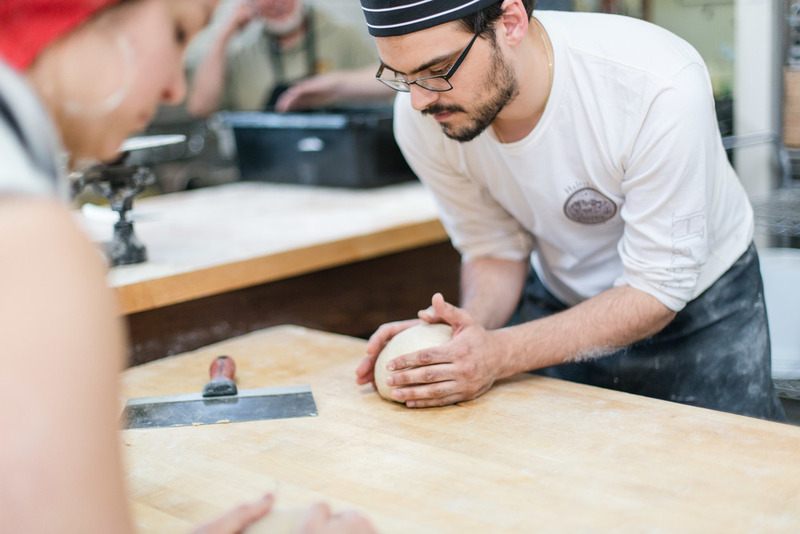 We’ll cover scheduling, sourdough management, preferments, oven challenges, and bread storage. You CAN make truly great bread at home! In this class, we will learn to bake with some of the ancient grains – spelt, rye, emmer, einkorn, kamut and amaranth, quinoa and others. The recent availability of these ancient grains adds a range of flavors and textures to the bakers’ palette. As in our basic artisan baking class, we will consider the chemistry and biology of bread, and provide an introduction to fermentation skills, bakers’ math, and a range of handwork skills. Each student will get plenty of oven time, and you will go home with a lot of bread! Challah! Vollkornbrot! Pretzels! 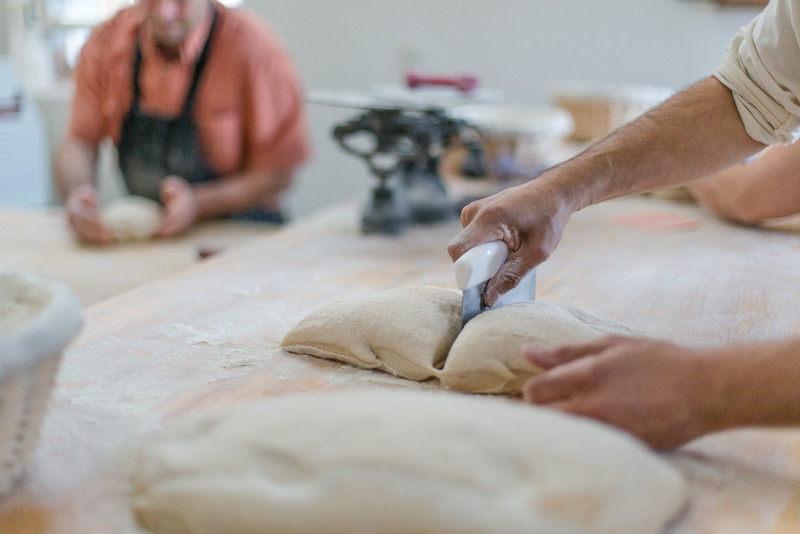 Come join us for a day of making a wide variety of specialty breads. From learning how to make a classic German style Vollkornbrot, to practicing your challah braid – you’ll leave with a whole new set of skills. This is the perfect class to build on the techniques learned in Basic Artisan bread baking, though it’s not required to have taken that class first. You can purchase a class at our online store HERE, or by sending us a check through the mail. In order to reserve your spot in a class, we ask for payment in advance. The baking classes costs $250 per person except the Pie and Pizza classes, which are shorter and are $175 each. Please contact us first over the phone or over email in order to make sure there is still room in a class before you mail a check! REFUNDS: If you cancel your attendance up to FOUR WEEKS in advance, we offer a 90% refund. If you cancel up to TWO WEEKS in advance, we offer a 50% refund. After that, we don’t offer any refund at all. Please plan ahead! The best way to befriend bread is to know it with your hands, over and over again. In this class we will shape and score hundreds of loaves of bread. More bread than you would bake at home in years! This class offers a rare opportunity to develop your skills at the bench alongside professional bakers. Join Rachel from Kinship & Company to learn all about pie! We’ll make an all butter pie crust with Farmer Ground Flour, as well as a crust blended with your choice of an alternative grain (rye or spelt). While making the pie crust, we’ll discuss the best ways to make pie dough that is flaky yet easy to work with – and we’ll use these doughs to make a double crust fruit pie, as well as a single crust custard pie with a blind-baked crust. We’ll eat lunch while the pies are baking, and then you’ll go home with two pies. 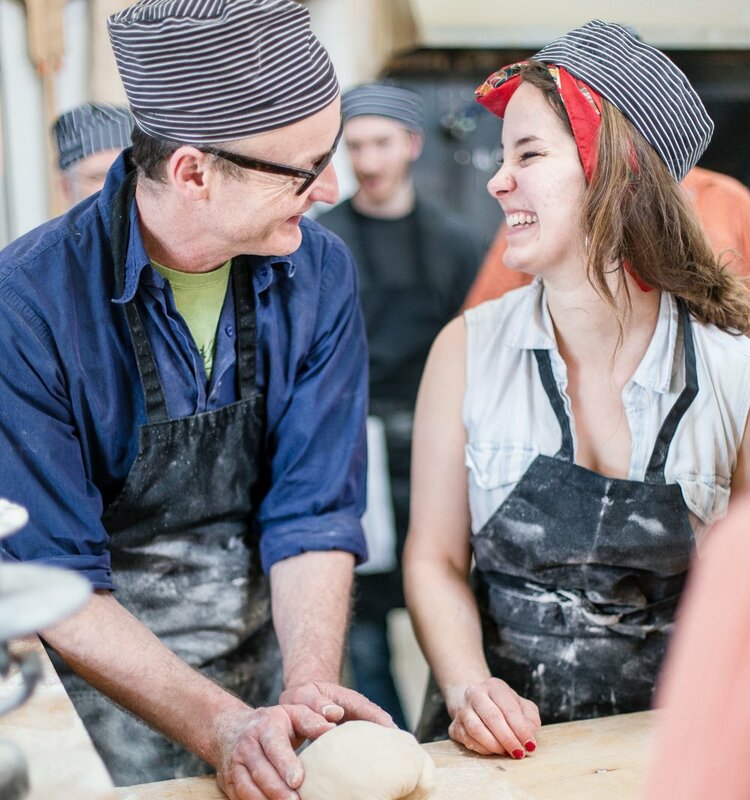 Although the rest of our classes focus on using the big white oven that’s built into the center of the bakery, this class is focused on our other oven – a delightful, mobile black oven that’s perfect for making pizza. Join us for an afternoon of making pizza from start to finish, and learning how to fire and cook in a black oven. We get many calls from folks seeking advice on building and operating a small bakery. In this class, we will consider the process of creating a bakery – how to design it, fund it, build it, and use it. We will consider equipment choices, building layout, financing, marketing, and of course, baking! This class is a great opportunity to ask detailed questions and to investigate a living, breathing bakery! The class is more than talk, however. We will also bake bread, the better to know it. In this introductory class we will make a variety of rye breads, including Vollkornbrot, Farmer’s Bread, Finnish reikäleipä, and black rye. Rye handles, ferments, bakes, and tastes unlike wheat, and it demands different skills. Come make and eat some beautiful rye! Ever wondered how to make a delightful croissant at home? Join us for a day of learning the techniques behind hand and machine lamination, and for an exploration of all of the amazing things you can make from croissant dough! Lots of fun making delicious pretzels! Pretzels are easy, and WOW are they good! In this class we will make a variety of pretzels, including traditional Bavarian knots, pretzel rolls, sticks, nuggets, and Laugenstange. We will work with the traditional lye bath, and we will experiment with a less caustic baking soda solution. You can make great pretzels at home. We will teach you! Baking Classes are $250 each, except Pie and Pizza, which are shorter classes and are $175 each. Standard baking classes are a FULL day (8 AM – 6 PM), and include breakfast snacks and lunch. Pie and Pizza both run from from 10 AM - 4 PM, and includes lunch.